Custom stationery is fundamental to your unique corporate identity, and an easy, inexpensive way to highlight your company brand. Creating custom stationery, from letterhead to business cards, envelopes to document holders, that are in sync, consistent and provide the look you want is the foundation of projecting a professional image. 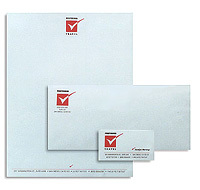 Dataguide provides a complete range of custom stationery products from standard #10 envelopes to embossed fold over business cards with foil stamping on almost any paper grade. Our professional graphics staff will work with you to ensure you get the look and materials you want at the best possible price. We provide custom stationery to businesses all over the country, our professional graphics staff will help you create the right look and our centrally located manufacturing facilities will ensure all your custom stationery products arrive as quickly as possible. 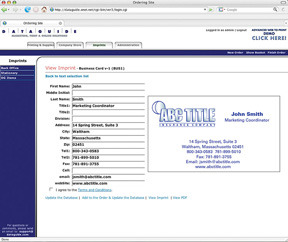 Click here to request a quote and find out how Dataguide can help with all your custom stationery needs. Complete custom design you are not restricted by pre-defined templates. Master and shell programs to provide the highest quality at the lowest cost. Adding a new employee or opening a new office? Log in pick the item you need, add the new information, view the proof showing the changes you just added, submit and you're done. Give employees access to the items you choose, allow them to order but maintain approval authority before any order is completed. Access all order history in one place, track orders or download all activity to a spreadsheet for budgeting and planning. Our exclusive Point'N Click Ecommerce solution makes your work life better. Click here to try a live demo and see how Point'N Click can work for you.